Electro Surgery is a safe, comfortable and effective treatment which is used for the treatment of facial thread veins and other venous conditions such as venous lake, poikiloderma, Campbell de morgan spots and spider naevai. How is Electro Surgery performed? As facial thread veins and lesions are very fine and delicate, a magnifying lamp surrounded by a circle of bright light is used to help guide the practitioner. A small, fine needle is put on to an individual thread vein or lesion and then a rapid, brief electrical current is released. This current cauterises the vein, destroying the vessel wall thus causes the blood to coagulate, and the vessel to break down and then disappear. Treatment times tend to vary and will depend on the size of the area to be treated. It is also important that an area is not ‘overworked’, therefore treatments are spaced out at regular intervals. 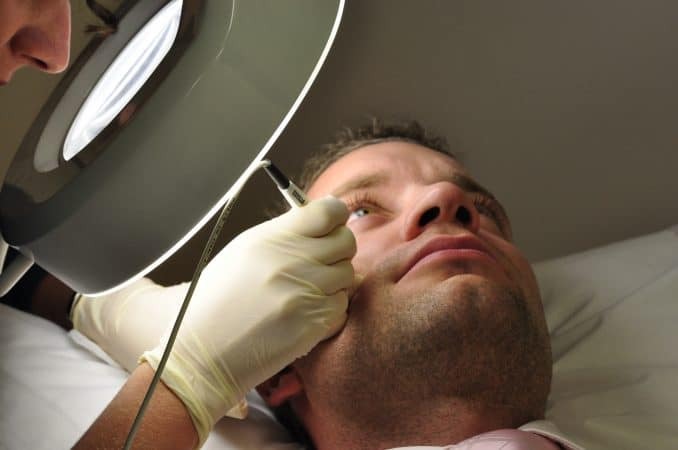 Electro Surgery is a minimally invasive procedure and recovery is relatively straightforward. Patients are asked to avoid touching or irritating the area that has been treated and to avoid direct sun exposure while the skin is healing. All patients are given a simple set of post-procedure instructions to follow to ensure optimum results. In contrast to Electro Surgery, IPL is used to treat more diffused facial redness as seen in people who have rosy cheeks or those who suffer with rosacea. IPL treats the deeper layers of the skin which enables it to reach and treat the deeper veins, without causing any damage to the surface of the skin. The IPL device emits rapid pulses of light which convert to heat when they strike the skin. These pulses are absorbed by the target structure in the skin, heating it and destroying it. The procedure feels like hot snaps on the skin which most people do not find uncomfortable and tolerate well. Patients may need to undergo several sessions to achieve the desired result and a treatment plan is discussed during an initial consultation. Normal activities can be resumed immediately after the IPL treatment. There may be some redness although this usually only lasts for a few days. . Patients are asked to avoid hot saunas and showers on the day of treatment and to avoid direct sun exposure while the skin is healing. 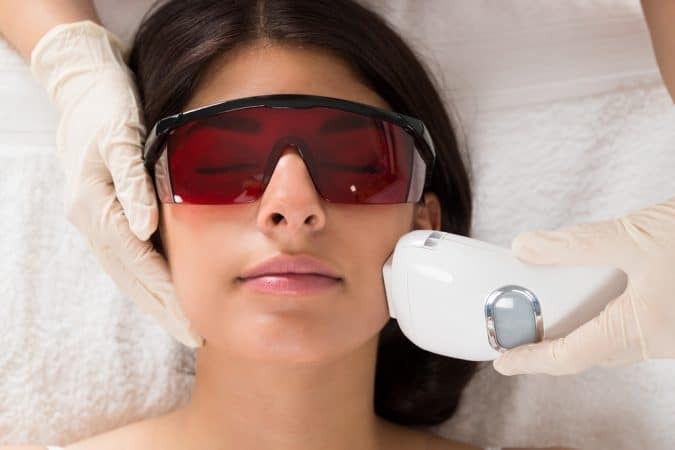 For enlarged veins on the face that are unlikely to respond well to either Electro Surgery or IPL, The Whiteley Clinic would recommend treatment with an Nd:Yag laser. The laser uses heat and is well suited to treat deeper vascular lesions. The energy is delivered using long pulses which are converted into heat in the tissue and destroy cells. It is possible that patients will experience some mild swelling and even mild bruising that will last up to two weeks post treatment. To avoid scarring, patients are asked to minimise the risk of sun exposure by applying an SPF50 and ensure the area treated is kept away from direct sunlight. For more information about any of the above treatments or to book your consultation, please call 03300 581 850 or email info@thewhiteleyclinic.co.uk. We look forward to welcoming you at our clinic.